Brisbane's late night dining scene continues to flourish with the addition of the very cool Kwan Brothers on Alfred Street in The Valley. Perched next to Alfredo's Pizzeria, just around the corner from Alfred & Constance, this pan-Asian share plate spot — the newest Brisbane venue for Damian Griffiths — has solidified this corner of Brisbane as a triple threat for creative food and drinks, and equally inspiring interiors. Kwan Brothers would be just as at home in Brooklyn or Bangkok as it is in Brisbane — the fit out is the work of Alexander Lotersztain of Derlot (the interiors king responsible for West End's Depo, Limes Hotel, as well as A&C and Alfredo's) and the space is a mish-mash of Shanghai glitz and street appeal; Disco balls meet Gangnam Psy. And it's a party. If you can tear your eyes away from the décor you'll find a menu of large and small share plates, as well as snack-sized meals ideal for downing with a few Eastern-influenced cocktails (created by Tiki master Richard Boccato). The dishes on offer veer between the highly creative (the Vietnamese salmon tartare served on prawn crackers is a standout) and more traditional Asian offerings. It's obvious that every effort has been made to make this fare, which includes Japanese, Vietnamese, Chinese, Thai and Korean influences, authentic and flavour packed. 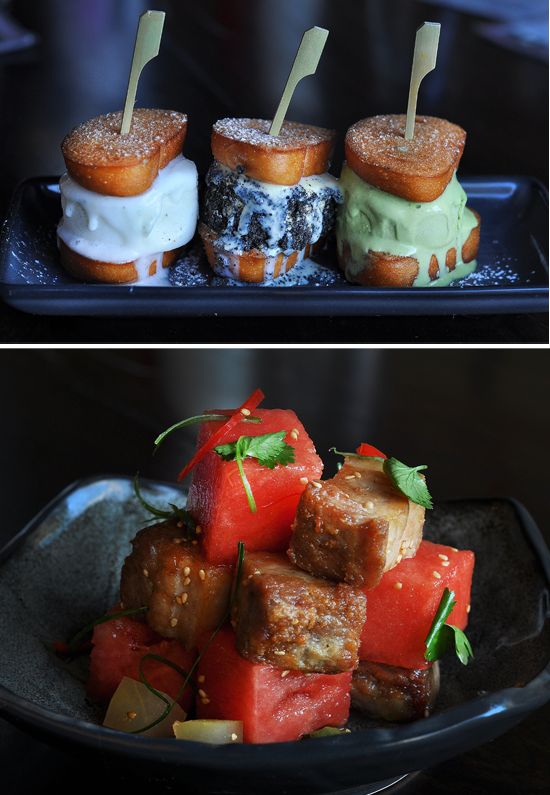 Highlights from the menu include the pork belly bao sliders with coriander and daikon, which were sticky and delicious, the charcoal grilled lamb ribs, the smoked eggplant, and the crunchy sweet corn fritters with Sriracha butter. But everything we had was good, and would be even better with a beer or two. The cocktails on offer are something else. The Coco Loco comes in a coconut shell — and, who are we kidding, we'd order it for that alone — but the rum, cream of coconut, kaffir lime, pineapple, and peppercorn syrup combination is a real treat. While the Far Eastern Sour uses plum wine, lychee liquor and aged Japanese whisky to knock your socks off. Kwan Brothers sits in that happy middle ground between bar and restaurant — just the kind of place that makes you want to partake of a cocktail or two, and joins the small but growing list of Brisbane late-night dining restaurants that do great food. Like any good late-night dining restaurant, Kwan Brothers does takeaway, and is open for lunch and dinner 7 days a week until 11pm when the restaurant closes for the night (but the bar kicks on 'til late). This groove shack does not take bookings; it's first in, best dressed! Kwan Brothers opens from 5pm today. 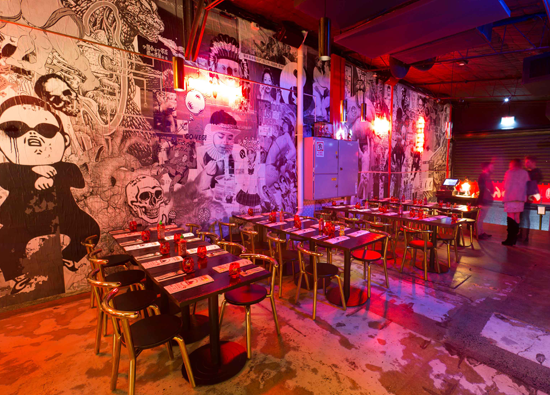 Click here for more of Brisbane's best late night dining!